Today was awash with temptation. So many flyers. So many sales. I almost gave in. I had my keys in my hand and I was going to go to Canadian Tire to buy a fantastically priced storage unit. But then I thought about yesterday’s post. Buy nothing at a big box. I tried to rationalize my way out. It’s a good price. I would help solve a storage problem I have in my seemingly tinier and tinier house. And then, I decided to wait for 20 minutes before I made the decision. By the time the 20 minutes was up, I was over it. I save myself the money and I’ll got on with the day. Temptation is a harsh reality of our consumer culture. 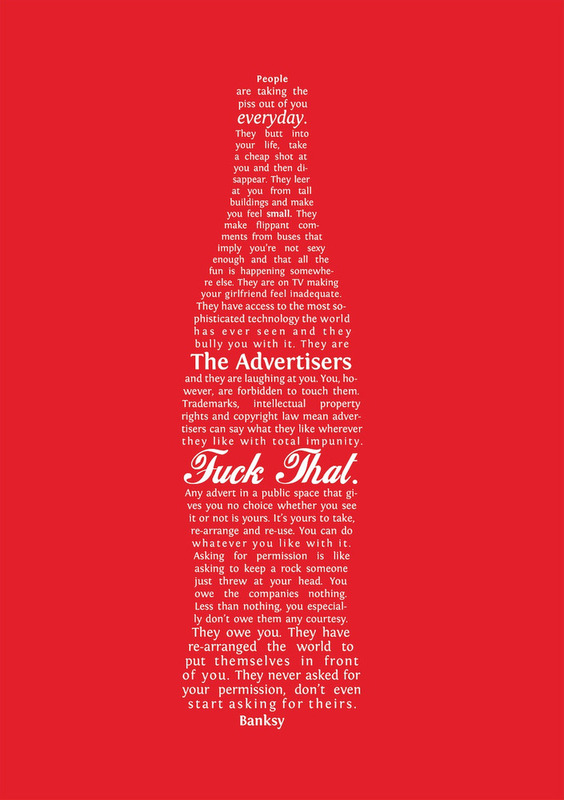 It puts me in mind of Banksy coke bottle manifesto (at least that’s what I call it). Ironically, I work in marketing – but I like to think I’m the uncola of marketing – and I think the work we do speaks to that. But anyway, I digress. Banksy’s coke bottle probably saved me a hundred bucks today. Maybe it’ll save you some money too. Here it is. If this won’t help you find resistance, then I don’t know what will.